While the RV life can be a luxurious experience, there are definitely parts of keeping your rig in good condition that are less glamorous. One not-so-fun but highly important element of making sure you have an enjoyable motorhome experience is maintaining your toilet and black water tank. Your RV is equipped with several different tanks for a variety of purposes, but the one that matters when talking about your sewage system is the black tank. This receptacle is used as a temporary holding container for waste from your toilet, and when not properly cared for, it can cause a variety of unpleasant odors in your coach. To keep your sewer tank working (and smelling) properly, you will need to give it a quick clean before and after using your RV, as well as an additional deep-clean every few weeks. Before you begin, be aware that sewage contains harmful pathogens and bacteria, so make sure you take the proper precautions to minimize contact with the contents. It’s generally suggested that you not dump your black water tank until it’s at least two-thirds full so the weight will force the contents to properly drain. If you need to drain your tank before it’s completely full, you can fill it up the rest of the way with water. Start by hooking up the sewer hose, ensuring you have a tight seal. You may also need to elevate the hose with some type of support to get a good angle and help the draining process. Once the tank is empty, be sure to flush it out, either with your RV’s flushing system or with a tank wand, to make sure it’s clean. The last step you’ll want to take when cleaning your black water tank is to treat it with a holding tank chemical to keep odors to a minimum and also help break down waste. Be sure to choose one that is eco-friendly, as it’s not only a more effective option, but is also safe for use around people and pets. Start by adding enough water to cover the bottom of your tank, and add the solution by filling the toilet bowl and flushing it down. Generally four ounces per forty gallons of tank space is appropriate, but double check with the instructions for whichever treatment you purchase. 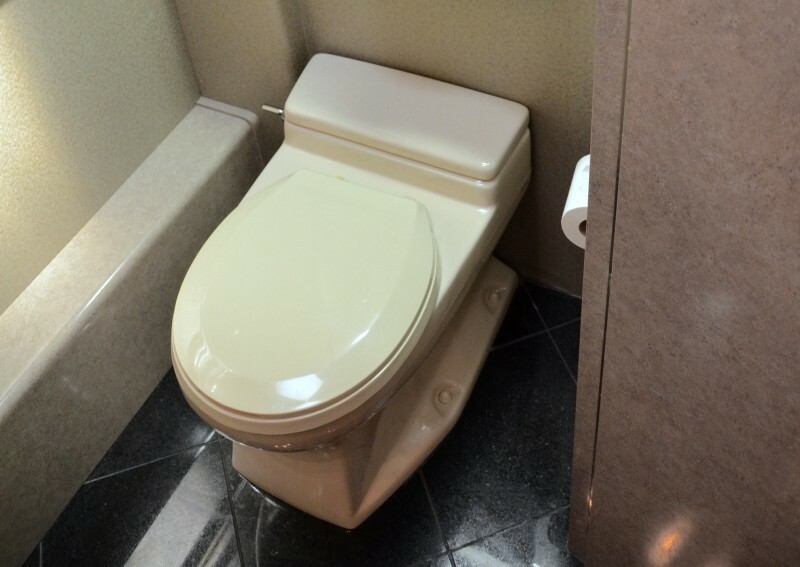 When it comes to taking care of your motorhome’s toilet, keep in mind that it’s slightly more delicate than your at-home version. Because of this, you’ll need to make sure you purchase cleaning solutions and toilet paper that are designed specifically for RV usage, as these products are made to break down in little time to make draining and cleaning easier. Avoid flushing anything that can’t be dissolved by your tank’s treatment chemicals, as they can create blockage and overflow issues. Also, be sure to periodically check your toilet to make sure the seal is working properly. This seal is designed to keep black tank odors out of your coach, and also makes sure water stays in the toilet bowl at all times. If the seal dries out, it may leak and allow the unpleasant smells to seep in, so be sure to lubricate the rubber every once and a while with plumber’s grease. Even though it might be less fun than hitting the highway in your rig, regularly cleaning and maintaining your black water tank and toilet will make a world of difference in the comfort of your coach. 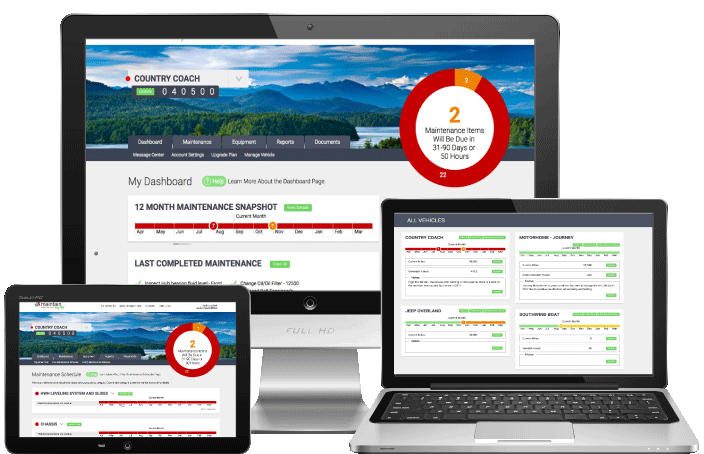 To ensure you keep up with these less-luxurious tasks that keep things running smoothly, use your online RV maintenance log on www.maintainmyrv.com and get the most out of the road ahead.